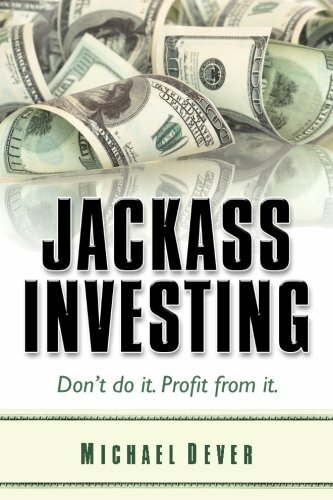 Jackass Investing is as provocative as its title. Mike Dever systematically rips apart the conventional investment wisdom - myth by myth - then replaces it with a "return driver" based methodology that results in a "Free Lunch" portfolio - one that produces both greater returns and lower risk. More than ten years in the making, and supported by the twin pillars of extensive research and more than 30 years of trading experience, this book finally lays to rest the traditional investment paradigm. As you might have guessed, this is not your typical investment book. "Controversial" and "ground-breaking" are two words that have been used to describe it. Jackass Investing presents an entirely new, and eminently logical, process for investing - all of it supported by numerous relevant facts and studies. But Jackass Investing is not a dense financial tome. It is extremely readable and includes entertaining and relevant references to popular culture - such as Criss Angel's magic, the rock band Rush and heavyweight boxing contender "Fast" Eddie Chambers - to help describe investment concepts in a truly approachable way. Perhaps most importantly, the book is also highly practical. As a bonus, the author has created a companion web site that includes specific actions you can take to turn your "Poor-folio" into a truly diversified portfolio - one that can make you money in even the harshest environments. This is certainly the one book that will transform your way of thinking about money and how you invest it. - Are you a Seinfeld fan? In Myth #3, learn what George Costanza can teach you about market timing. Then read the "Action Section" to see an actual trading strategy you can use to profit from the behavior of those people who do mis-time the market. - Think that the largest investors have an edge over you? In Myth #15, read why the opposite is true. In the action section see an actual technique that has been shown to outperform the S&P 500 by more than 5% per year. - What can the behavior of football fans teach you about investing? Find out in Myth #16. Learn how even the largest investors have a bias in their investing - one that you can exploit to create a truly diversified portfolio. - Do you believe it is impossible to both increase returns and reduce risk? That's understandable. The conventional financial wisdom preaches that ad nauseum. But in the final myth, find out why - and how - it is possible. See actual portfolios you can use to produce greater returns with less risk than those that follow conventional financial wisdom. These are just a handful of the many entertaining examples of investment myths and specific trading strategies you will learn when reading Jackass Investing. There is no other book like it that combines entertainment with financial education and a practical "how-to" guide. Learn what most of Wall Street doesn't know, and what those who do know, want to keep from you. If you have any questions about this product by Brand: Ignite LLC, contact us by completing and submitting the form below. If you are looking for a specif part number, please include it with your message.